Art was at the forefront of design decisions when transforming this traditional Clayton ranch into a contemporary open floor plan. Avid collectors, the homeowners wanted their art to shine. The cabinetry and finishes were to be a backdrop that would not fight with the bold, bright colors of the owner’s collection. Designer Keith Gegg, Gegg Design & Cabinetry, kept the kitchen sleek and contemporary with crisp white-quartz counters and solid-acrylic upper cabinets. For contrast, the bases and refrigerators were done in a stained mahogany, carrying a grid pattern throughout the lower cabinets. 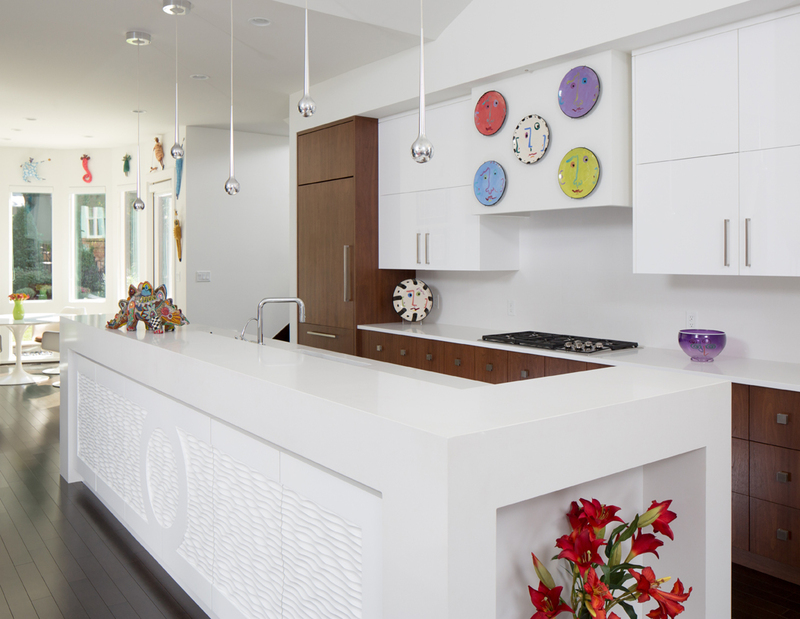 A showpiece in and of itself, the island features geometric-patterned doors and sculpted panels. The end of the island facing the foyer has a niche where the homeowners are able to display large pieces of art or sculpture. Though a galley kitchen, everything is at the cook’s fingertips. The multilevel island houses a microwave drawer, oven, sink, trash and recycle center. A Wolf cooktop along the back wall is topped with a drywall hood that is the same color as the wall, so that it simply disappears and becomes the backdrop for the unique painted-plate collection. The openness of the kitchen makes you feel like you are in a gallery that you just happen to be able to cook in. Wow, this is different than what you typically see in St. Louis, but it truly shows off the owners’ collection and personality. The art pieces are the focus and the kitchen falls in with them.